Today Intel is introducing their SSD 545s, the first product with their new 64-layer 3D NAND flash memory and, in a move that gives Intel a little bit of bragging rights, the first SSD on the market to use 64-layer 3D NAND from any manufacturer. 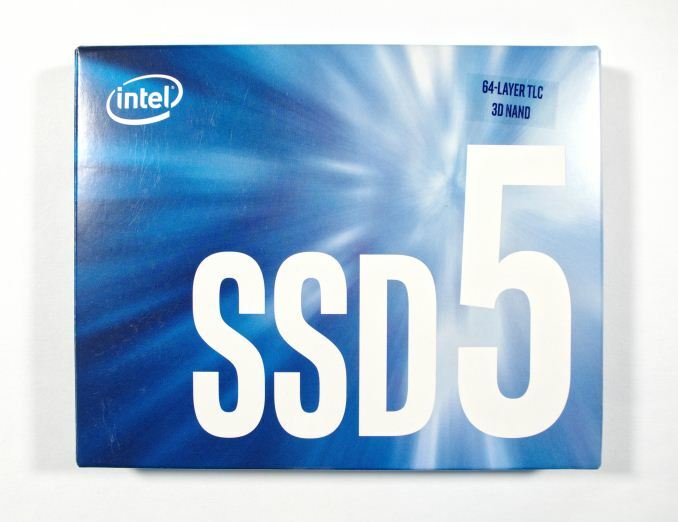 The Intel SSD 545s is a mainstream consumer SSD, which these days means it's using the SATA interface and TLC NAND flash. The 545s is the successor to last year's Intel SSD 540s, which was in many ways a filler product to cover up inconvenient gaps in Intel's SSD technology roadmap. When the 540s launched, Intel's first generation of 3D NAND was not quite ready, and Intel had no cost-competitive planar NAND of their own due to skipping the 16nm node at IMFT. This forced Intel to use 16nm TLC from SK Hynix in the 540s. Less unusual for Intel, the 540s also used a third-party SSD controller: Silicon Motion's SM2258. Silicon Motion's SSD controllers are seldom the fastest, but performance is usually decent and the cost is low. Intel's in-house SATA SSD controllers were enterprise-focused and not ready to compete in the new TLC-based consumer market. 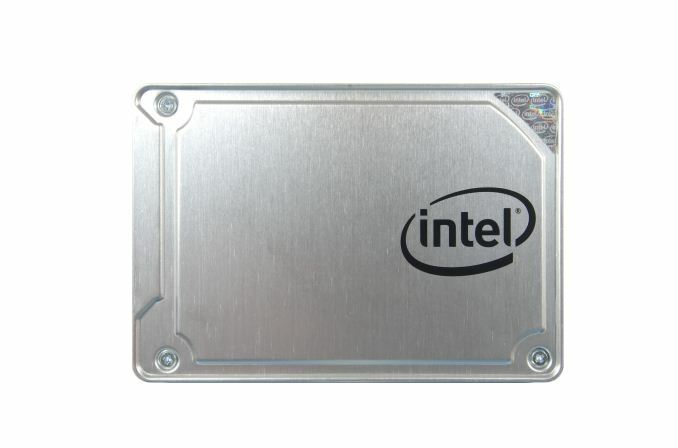 The Intel SSD 545s continues Intel's close relationship with Silicon Motion by being one of the first SSDs to use the latest SM2259 controller. 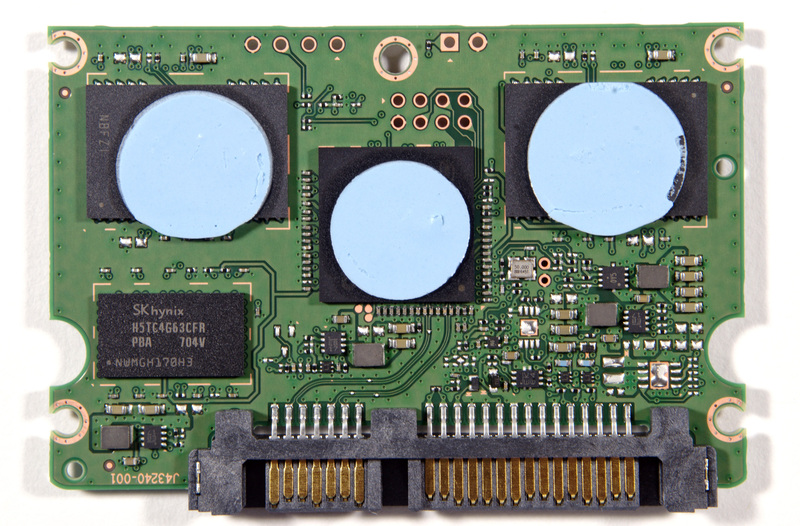 Since the SATA interface is now a dead-end technology, the SM2259 is a fairly minor update over the SM2258 controller used by last year's Intel SSD 540s. The only significant new feature enabled by the updated controller is hardware end-to-end data protection that includes ECC on the controller's SRAM and on the external DRAM. This will make the 545s more resilient against corruption of in-flight data, but it should not be mistaken for the power loss protection that is typically found on enterprise SSDs. The flash memory used in the Intel 545s is Intel's second generation 3D TLC NAND, a 64-layer design with a floating gate memory cell. Intel did not use their first-generation 32-layer 3D NAND in a consumer SATA SSD, but the 32L 3D TLC is at the heart of Intel's SSD 600p, their first M.2 NVMe SSD and one of the most affordable consumer NVMe SSDs. Similar to the strategy Micron used last year when introducing the Crucial MX300, the Intel 545s initially brings a new generation of 3D NAND to the market with just a single SKU. The 512GB 545s is available now on Newegg, with other capacities and the M.2 SATA versions to follow over the next few weeks. The full lineup will include capacities from 128GB to 2TB in both 2.5" and M.2 form factors. Intel will be using their smaller 256Gb 64L TLC die for all capacities of the 545s, rather than adopting the 512Gb 64L TLC part for the larger models. The 512Gb die is not yet in volume production and Intel plans to have the full range of 545s models on the market before the 512Gb parts are available in volume. Once the 512Gb parts are available we can expect to seem them used in other product families to enable even higher drive capacities, but it is reassuring to see Intel choosing the performance advantages of smaller more numerous dies for the mainstream consumer product range. Meanwhile, over the rest of this year, Intel plans to incorporate 64L 3D NAND into SSDs in every product segment. Most of those products are still under wraps, but the Pro 5450s and E 5100s are on the way as the OEM and embedded versions of the 545s. The downside is that this is a rushed launch; I've had the drive in hand for less than five days as of publication time, and that time spanned a weekend. Intel's press briefing on this drive was a mere fifteen hours before the embargo lift, and the slides included some changed specifications relative to the product brief that was delivered with the drive last week. As with several of their recent SSD launches, Intel is only providing the one-page product brief and is withholding the full specifications document from the general public and the press, but this time it might genuinely be due to the latter document not being ready instead of motivated by the questionable IP security concerns Intel cited earlier this year. The most significant performance improvement Intel cites for the 545s over the 540s is in sustained sequential transfers where writes exceed the size of the drive's SLC cache. In the briefing for the 545s Intel claimed the 480GB 540s would drop to 40MB/s while the 512GB 545s is capable of maintaining 475MB/s. The numbers given for the 540s are lower than what the full product specifications from last year list (125 MB/s). Without access to the comparable document for the 545s we can't entirely explain this discrepancy, but the most plausible reason is that Intel is no longer measuring sustained write speed restricted to an 8GB span of the drive and that they are now instead using a more sensible test where the drive is full or nearly so. Either way, the 545s should be able to perform much better after its SLC cache is full. 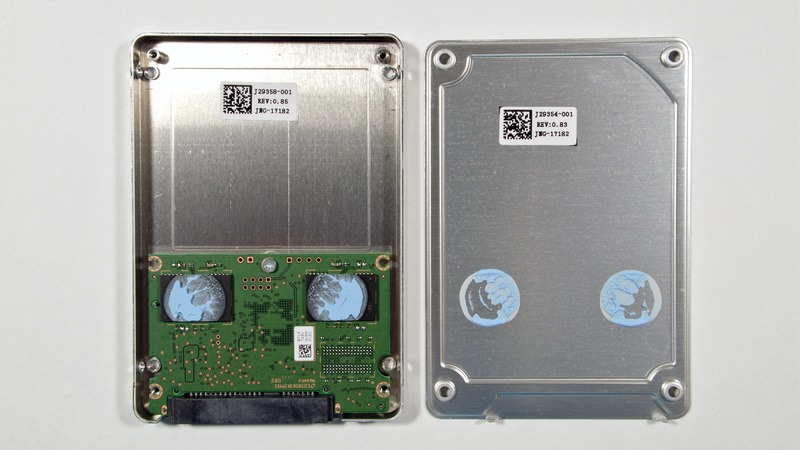 Externally, the 545s looks like a typical Intel SATA SSD with only minor design variations. Internally, the density of Intel's 3D NAND is readily apparent from the PCB that occupies less than half of the case and features only four NAND packages. With 256Gb (32GB) per die, this works out to four dies per package. Even the largest 2TB model should be able to use this PCB with sixteen dies per package and populating the empty pad for a second DRAM package. The Intel SSD 545s uses thermal pads on all four NAND packages and on the controller. The 512GB Intel 545s debuts with a MSRP of $179. This is slightly higher than the launch MSRP of $174 for the 480GB Intel 540s, but on a price per GB basis the 545s is cheaper, and since its launch the MSRP of the 540s has been driven up to $189 by the onset of an industry-wide NAND flash shortage. In this narrow context the MSRP for the 545s may seem reasonable, but its true street price will need to be substantially lower. Intel's 600p NVMe SSD is currently only $175 on Newegg. Since the 600p outperforms any SATA SSD for typical real-world desktop use, the 545s needs to do better than 35¢/GB. The competition based on Micron's 32L 3D TLC includes the Crucial MX300 for around 30¢/GB, and the Samsung 850 EVO 500GB happens to be on sale on Newegg today for $165 (33¢/GB). This launch comes at a bit of an awkward time for us. I've retired our aging 2015 SSD testbed and moved all the custom and homemade power measurement equipment over to a new system. Windows 8.1 is out and Windows 10 is in, and our IOmeter synthetic benchmarks are being replaced with Linux-based FIO tests that are more suited to modern TLC SSDs with SLC caches. For the past few weeks I've been focusing my efforts on validating the new testbed and test suite against NVMe SSDs, so the arrival at short notice of a new SATA SSD left me with no relevant comparison data. Given the time available, I chose to prioritize the benchmarks that are most relevant to real-world usage and to run a small selection of competing drives through those tests. This review will be updated with more benchmarks as the drives complete them, and the new SSD 2017 section of our Bench database will be going live soon and will be populated with results from the dozens of drives in our back catalog over the coming weeks. For now, this review includes our three AnandTech Storage Bench (ATSB) workloads run on the new testbed, SYSmark 2014 SE and idle power management tests. The Intel SSD 545s is pitted against its predecessor the Intel SSD 540s, and most of the SATA SSDs with 3D NAND that have been on the market: Samsung's 850 EVO and 850 PRO, the Crucial MX300 and the ADATA Ultimate SU800. It IS nice to see some serious competition for the Evo. The 850 Evo is still my go-to for upgrading older systems from a mechanical drive. Hasn't budged at all... I bought two 1TB EVOs two years ago, almost to the date (Newegg invoice is dated 7/15/2015 for the first one), paid $340 for one and a couple weeks or a month later I managed to get a second one for $320. I guess that couldn't last, historically the flash market has been more volatile (no pun intended) than not, the kind of stability that went on for a couple years aligned with Samsung's rise to SSD dominance were kind of rare in the grand scheme. There is nothing strange about it, they know if flash is in shortage they will make more on every grain of sand they put into it. It is like an implicit mutual agreement to sustain an artificial shortage to make more money. And everyone is happy. They still sell as much SSDs as they can, but at a higher price. SSDs are available, but the supply is deliberately held tight, so there is a perpetual "they might run out" even though supply exceeds demand, it is carefully kept short. Nobody is waiting on flash, no company is missing on sales, they still sell as much as they can, they simply take care not to exceed demand by too much, so they do less work to get extra profits. It is an immensely great deal for them. There is no motivation for any of the big players to end this shortage, because that would drive prices down, hurt their own margins and those of everyone else, and give the others an excuse for hostile actions in retaliation, which they don't really want, because even though to us they are apparent competitors, they are all in it for the money, and they have estimated that cooperating to keep supply tight will win them more than competing who will make the most or the best SSDs. Yeah, it should be illegal for a company to decide not drive prices down by flooding the market with cheap products, shm.